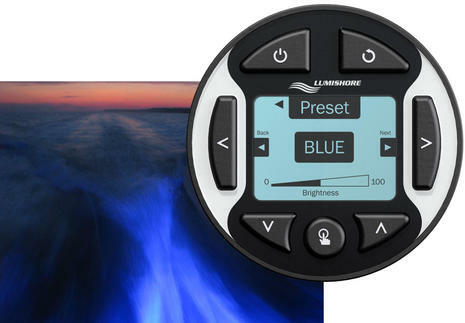 Though multifunction displays have been steadily gaining new functions, the Seakeeper and Lumishore buttons above represent a new era. 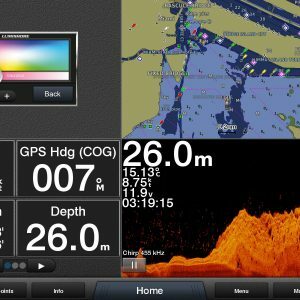 Garmin calls it OneHelm, but the underlying HTML5 app technology is an important innovation that all the major MFD manufacturers are embracing. It significantly simplifies the process of creating MFD control for other manufacturer’s onboard systems, and so a lot of interesting integration options like these will soon be available. 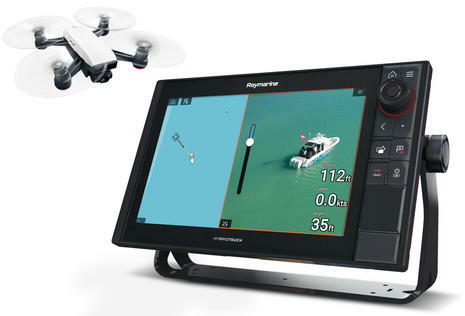 After the Miami show Ben Stein and I wrote “Raymarine MFD apps three ways: from drone control to sat comms to video streaming” because Ray’s latest operating system update nicely demonstrates three distinct ways that third-party gear (and service) interfaces can be integrated with an MFD. 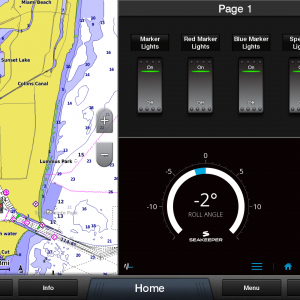 They all look like apps and the HTML5 variety that Garmin OneHelm employs involves a specialized Web server and an MFD browser, though part of the goal is that the boater won’t be aware of either. You may want to read our “three ways” entry before diving into some specific OneHelm (HTML5) implementations. 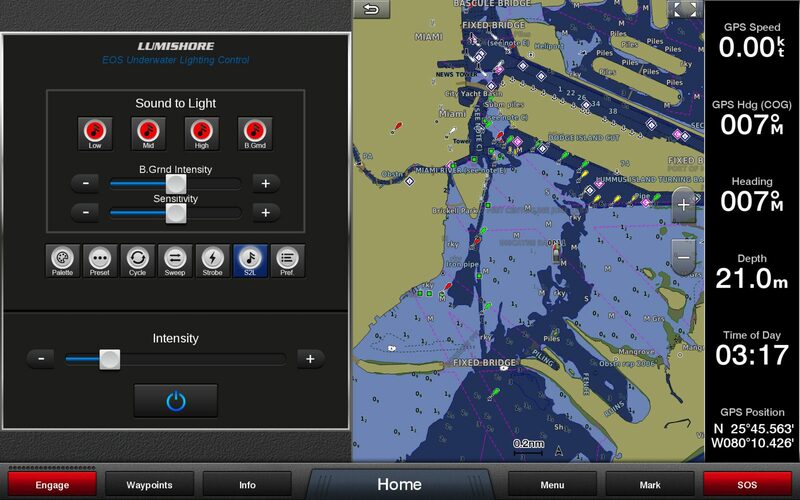 This Lumishore photo also illustrates what MFD apps are all about. 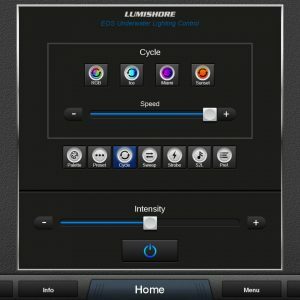 When I detailed the Lumishore EOS underwater light system, I was quite impressed with gauge-like Mini EOS Mini controller and alternate WiFi app. 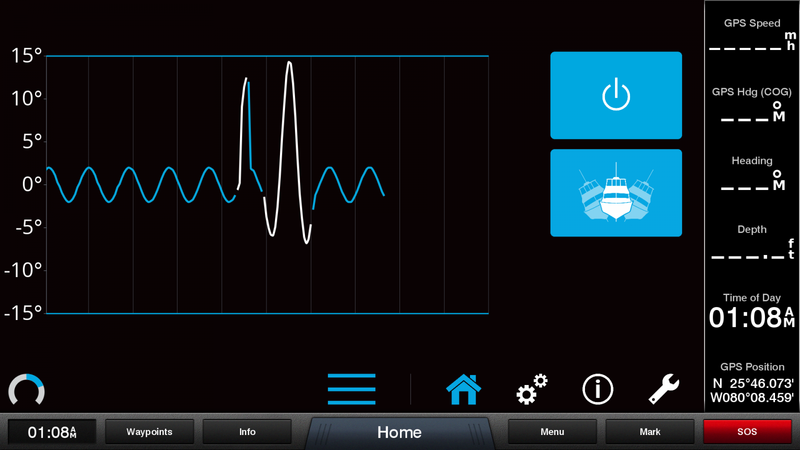 (And I’m still impressed after nearly two years of testing and showing off the system on Gizmo.) 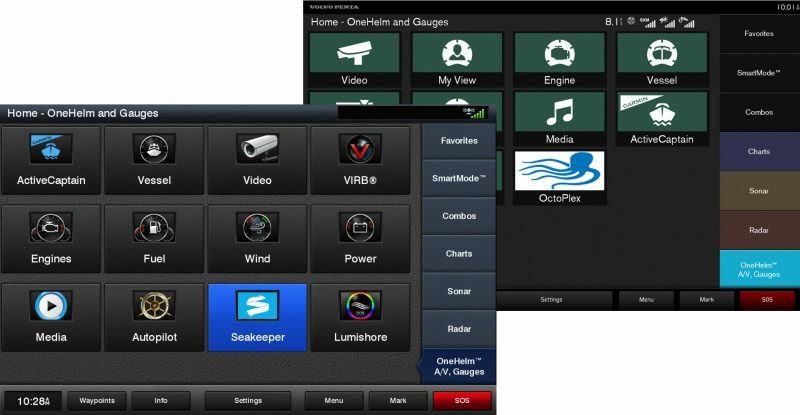 But how about if you could ditch the controller completely in favor of your big touchscreen, and also control your lights using the Garmin WiFi app that can do so much more? In these days of multitudinous function displays, those other gauges above could go too (if you and/or the boatbuilder thinks that makes sense). 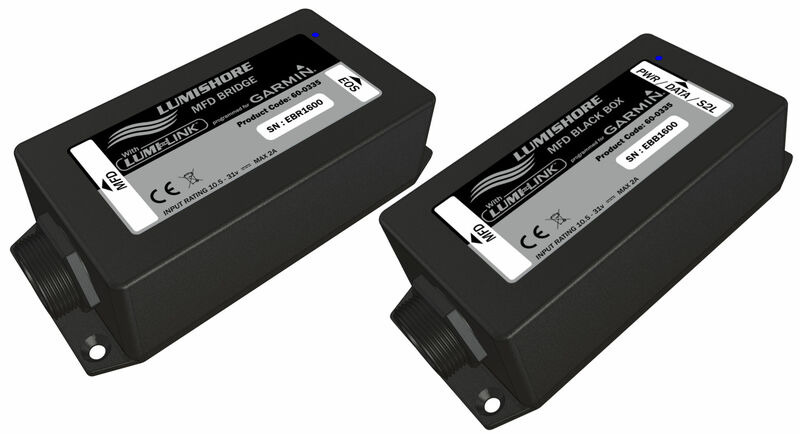 It’s the Lumi-Link MFD Black Box Module at right that does the trick. One end gets wired with 12-24v DC, a data cable to an EOS distribution hub (CANbus, I think), and an optional stereo jack connection if you want the Sound-to-Light feature (of course you do). LEDs on the module let you know the underwater lighting system is set up and then a Garmin Marine Network (Ethernet) cable direct to an MFD or to a network switch should cause the Lumishore button to appear in the main OneHelm menu, and you’ve got full light control on your Garmin screen. So why the Lumi-Link MFD Bridge Module at left? 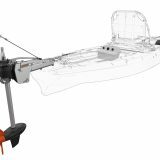 That’s for a boater who wants light control with both MFDs and Lumishore’s EOS Mini-i or EOS STV2203-i, and there’s also a Bridge for added Supra light models control. 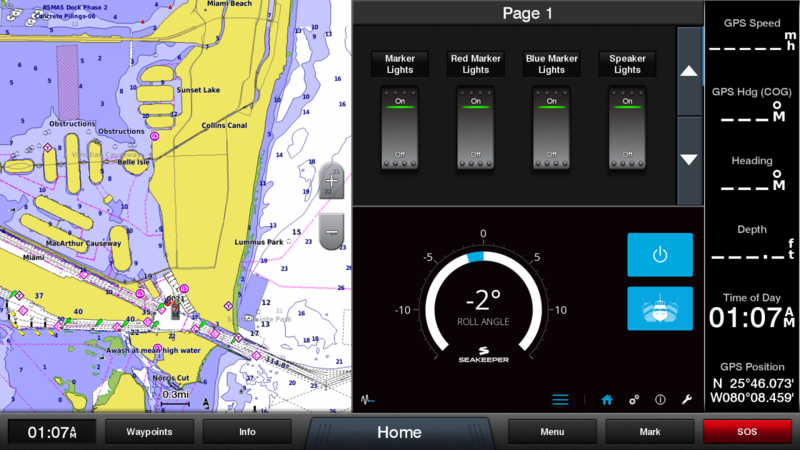 In all cases, the module is connecting Lumishore’s control protocols into an HTML5 app that is then served to a browser built into the Garmin MFD’s operating system. 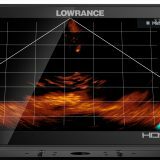 Judging from the three screenshots above, the Lumi-Link OneHelm interface looks powerful and quite easy to use, easier in some ways than the EOS Mini I’m used to. But I also notice that it betrays its somewhat foreign HTML5 roots in some ways, like the failure to fully scale to Garmin screen windows. Other OneHelm applications do scale nicely, so this is fixable, and not a big deal anyway. 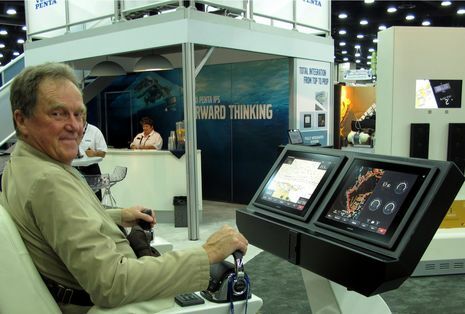 What is important to know about OneHelm at this point is that it only works on Garmin’s high-end 8400/8600 MFD series, as noted in the press release (and also on Volvo Penta Glass Cockpit displays based on the same MFD models, as seen in the screens at top). Apparently this limitation is because only those displays currently have the right browser capabilities. But many other brand MFDs do have such capabilities these days, and they aren’t necessarily top-of-line. 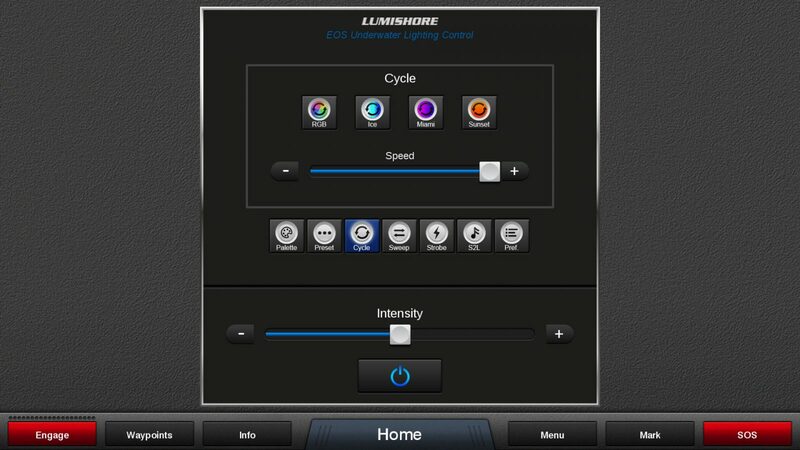 In fact we already spotted an app icon labeled “Lumishore coming soon” during the Raymarine Miami demos, And I won’t be a bit surprised to see HTML5 integrations show up on (Android-based) Furuno TZTouch2 screens soon (and native Android also means straight up Android app possibilities as also seen on Raymarine Axiom.) 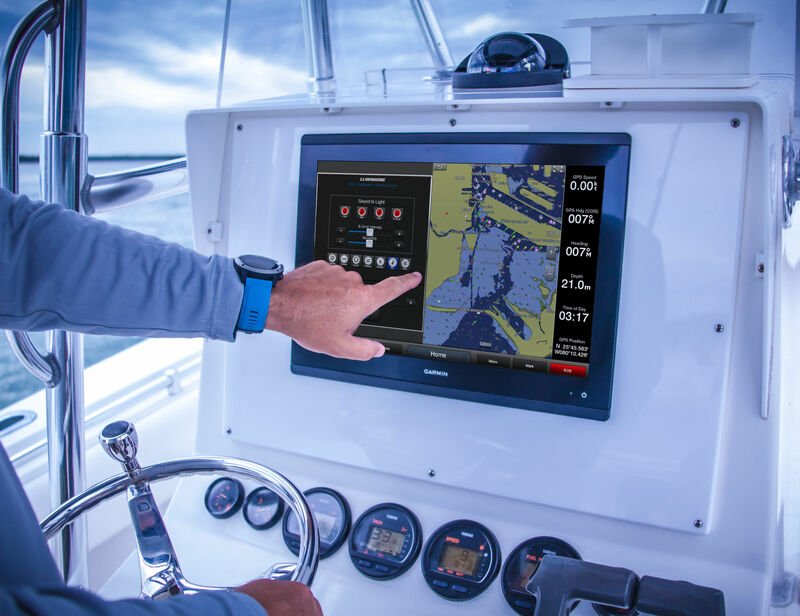 Plus, I first heard about this browser-based concept at a Navico “Full boat integration into one display cluster” presentation early last year. So far I’ve only seen one OneHelm application in action, but this Seakeeper demo certainly lived up to Ben Stein’s personal report on the technology. In fact, nowadays a boat outside a show with Seakeeper in large letters on the side does not have to ask for large wakes, and you can see some impressive gyroscopic stabilization on/off roll graphics on the screens below. 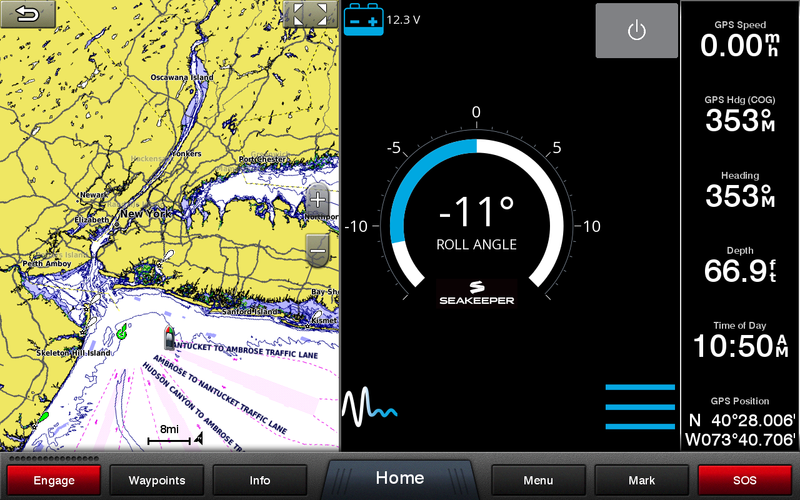 Now having the new Seakeeper OneHelm full screen on a huge MFD will not be normal practise — and sorry for the poor photo — but it sure was easy to turn it on and off with that big touch button, and interesting to easily watch changing tech details like the gyro speed and angle plus the 12v current draw (this was the Seakeeper 3, and the even smaller model 2 was unveiled). 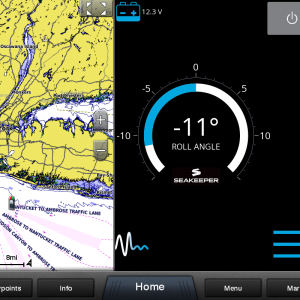 The Seakeeper interface looks natural on these three Garmin screenshots, I think, and it was also nice to learn that no extra module is needed. Apparently Seakeeper foresaw the HTML5/browser integration possibility and built web server capability into their standard 5-inch control head along with an Ethernet port. 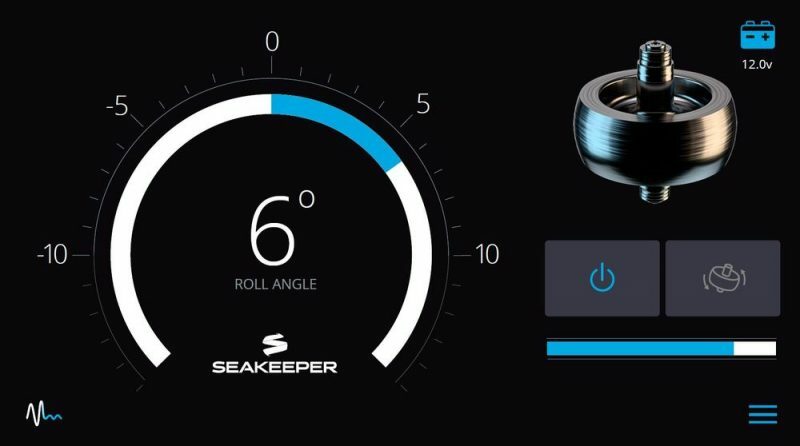 That does mean that you have to keep a Seakeeper control on your boat, but that’s understandable with this powerful level of machinery, and it’s certainly possible to install the small display out of sight somewhere and use the OneHelm application at a clean glass bridge helm. In fact, some of the Sabre Yachts team we met on a 45 Salon Express at the show seemed quite excited about that idea. 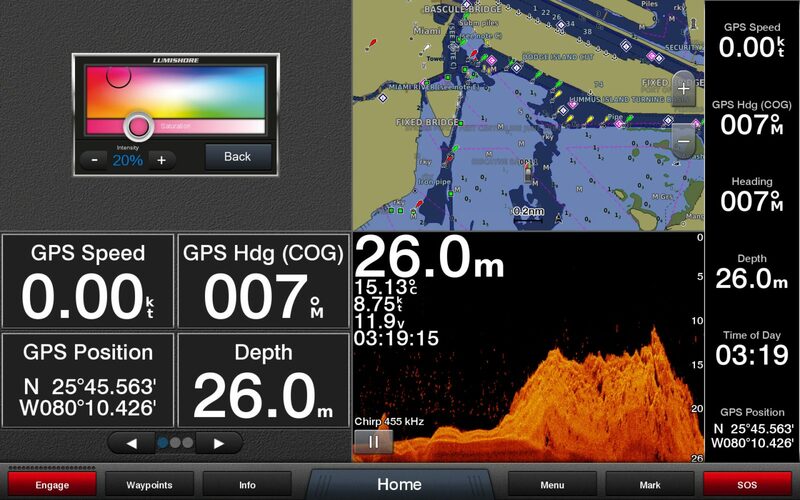 Again, the Seakeeper HTML/browser integration is not exclusive to Garmin OneHelm and, in fact, this Raymarine Axiom screen seems to have a bit more graphics pizzazz. More importantly, neither the web server hardware nor the MFD browser has to be changed significantly from brand to brand. That means boaters will get lots of choices largely because it won’t be a great burden for the MFD developers to offer them. Finally, while the Shadow-Caster OneHelm integration isn’t detailed online yet, I’m told it’s nearly done and it can control Shadow-Casters’ under- and above water LED lighting fixtures. 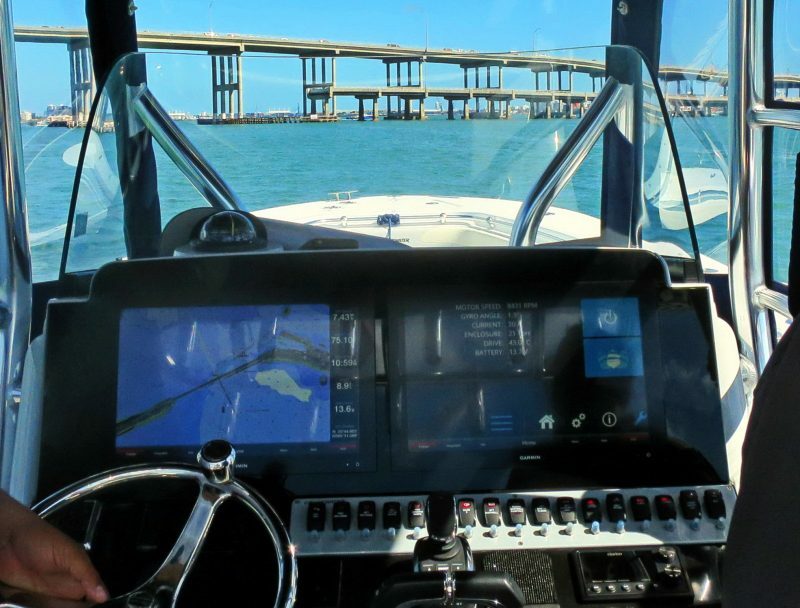 The helm shot above was recently taken on an almost finished Statement Marine center console, but don’t let the boat shots in this entry suggest that big, highly integrated MFDs are exclusive to this boat type. In fact, they are on all sorts of yachts these days, especially new ones, and even some sailboats. 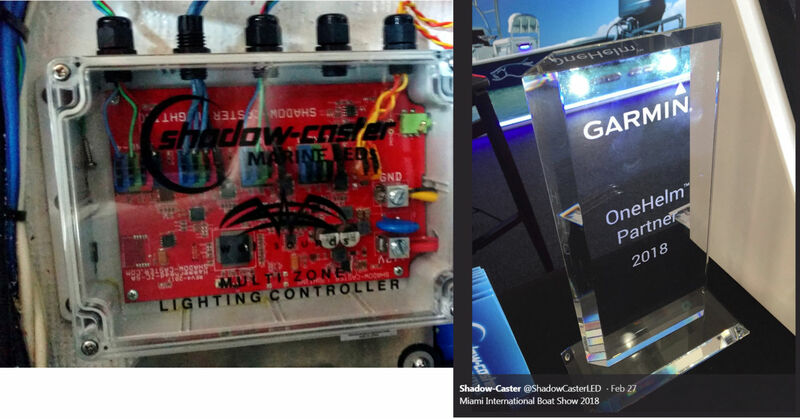 A particularly interesting thing about the Shadow-Caster lighting controllers and fixtures is that they not only use a CANbus protocol they call Shadow-NET, but they’re also designed to eventually support NMEA 2000. In fact, company president Brian Rogers chairs the NMEA working group for N2K lighting messages, and Shadow-Caster will likely be one of the first to offer N2K lighting control once the work is done. 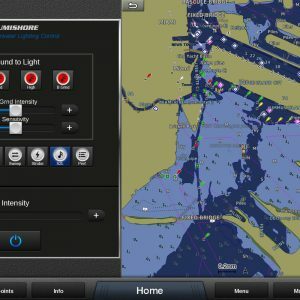 But Rogers is realistic about how long that may take — remember that once the NMEA lighting standards are set, then the MFD developers have to add controls that use them — and pleased to have the controller above that turns Shadow-NET into an HTML5 app that can simply display as designed on Garmin OneHelm. I sense a paradox; OneHelm (HTML5) seems like a quick and easy way to integrate, but NMEA 2000 could eventually be an even easier way. I suspect that these screens are mock-ups, but the concept is clear. 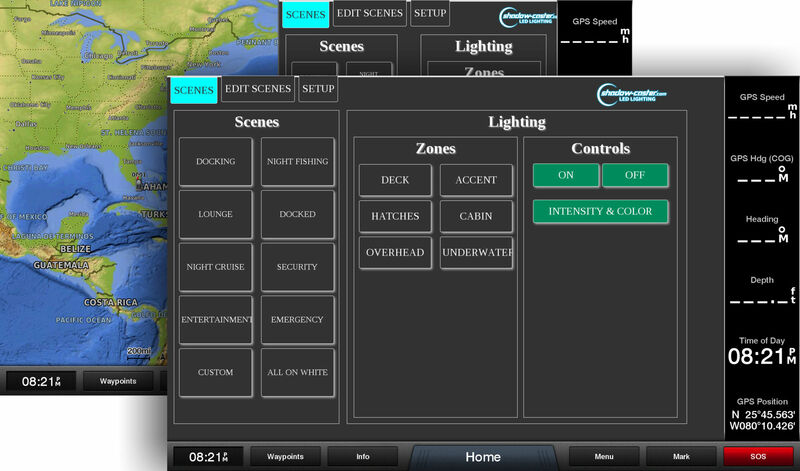 You can control sets of Shadow-Caster lights known as Zones and also create one-button “Scenes” that invoke multiple Zone presets. Nice! 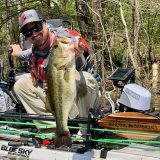 In my view, it’s wonderful that Garmin OneHelm now supports two different underwater lighting companies, and another may pop up on the OneHelm page at any moment. But note how many digital switching companies are already there, and that Garmin recently acquired Empirbus. Those are the subjects of OneHelm (HTML5) part 2, coming soon. This is all around fantastic news to see the industry embracing modern (ish) web technologies. I’m glad that most of them are doing it this way, and not forcing manufacturers to create custom apps for their operating system. 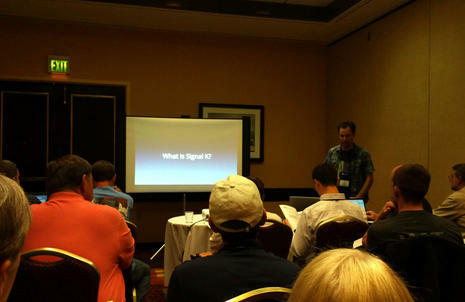 I think a great opportunity would be for an app store of sorts, where anyone could create and contribute an app. 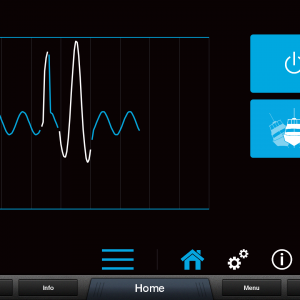 There are a ton of web interfaces I can think of, many which I have on my boat, that would be great to have as an app or interface on an MFD. SignalK comes to top of mind, and although I suspect some of the main line manufacturers consider it a threat, given the size of the industry, the more you can do something from one place, the more likely I think people are to invest deeper in the ecosystem. In general, even without an app store, this general industry move will be great for everyone who wants to control more from their MFD – and who doesn’t!